Most perceive the speed of light as being really fast. It's 671 million miles per hour. Fast enough to circle the earth several times per second. However, once you think about the speed of light within the context of our solar system, it starts to seem unimpressive. It takes about 1.3 seconds for light or radio waves to reach us from the Moon, which really isn't all that far away (it's only 20 times farther away than Australia is to the United States). This was an issue during the Apollo space program, because due to the round trip time of the radio signals, NASA had to wait about three seconds to hear the answer to every question they asked the astronauts. When Mars is closest to the Earth, it takes light three minutes to travel between the two planets. If you asked a question to an astronaut on Mars, you'd have to wait at least six minutes for an answer, and Mars is usually a lot farther away than that. At its greatest distance, you'd have to wait 42 minutes, or even longer if the astronaut is watching Gilmore Girls. In the future, there will be no such thing as sending an "instant message" to your friends on the Mars base. There also won't be any day trading or free pizza delivery. The Voyager 1 spacecraft was launched only 29 years ago. It's currently the farthest away from the Earth of any man-made object. In just a short amount of time, this spacecraft, designed by primitive 1970's-era engineers, many of whom were wearing corduroy bell bottoms, has managed to travel so far away from the Earth that it takes radio signals traveling at the speed of light 14 hours to reach it. An object that was recently built by people is now far enough away that if you could travel to it at the speed of light, for the in-flight movie you could watch the original director's cut of Water World four times, break for a dinner, and then watch Ishtar before having to put your tray in its upright position. Light takes four and half years to travel to the nearest star, 100,000 years to travel across the width of the galaxy, and 100 billion years to travel across the observable universe. 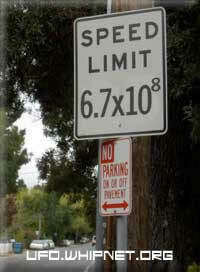 For any visitors to be able to drop in on us, they'll need a mighty fast ship that can defeat this limit. The speed of light isn't all that fast. The speed of light in a vacuum is an important physical constant denoted by the letter c for constant or the Latin word celeritas meaning "swiftness". It is the speed of all electromagnetic radiation in a vacuum, not just visible light. In metric units, c is exactly 299,792,458 meters per second (1,079,252,848.8 km/h). Note that this speed is a definition, not a measurement, since the fundamental SI unit of length, the meter, has been defined since October 21, 1983 in terms of the speed of light: one meter is the distance light travels in a vacuum in 1/299,792,458 of a second. Converted to imperial units, the speed of light is approximately 186,282.397 miles per second, or 670,616,629.384 miles per hour, or almost one foot per nanosecond. Through any transparent or translucent material medium, like glass or air, it has a lower speed than in a vacuum; the ratio of c to this slower speed is called the refractive index of the medium. Changes of gravity, however, warp the space the light has to travel through, making it appear to curve around massive objects. This gives rise to the phenomenon of gravitational lensing, in which large assemblies of matter can refract light from far away sources, so as to produce multiple images and similar optical distortions.